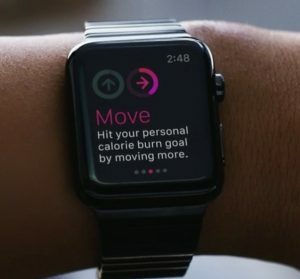 I bought the latest Apple device in May (2015) so now I’ve had it strapped to my wrist for a few weeks I thought it was time to write a review. Now I’ve got used to it I’m finding it quite useful for checking the time; I didn’t used to wear a watch, I relied on my phone so I’ve found it much less intrusive to glance at my wrist. Talk about going back in time – after not wearing a watch for 12 years – I’m rediscovering how useful it is! As I’m often with clients it is also invaluable for quick checks of notifications to see if things are urgent. It taps my wrist when I have incoming messages so there are no embarrassing ‘bleeps in the middle of meetings. I can glance down to see if I need to excuse myself and take action or if it will wait until the meeting is over. As I spend much of my time driving a desk, I can end up sitting in one place for hours at a time so I have found the activity monitoring app really useful. It reminds me to get up and move around every hour to get my circulation going and avoid that tightness in the shoulders you get from ‘computer hunch’. It’s great for getting me out of my chair – what’s measured gets managed! As my car has a built-in satnav I don’t really use the maps facility, but I can see how useful that might be if you’re on foot in a big city like London. Because it’s such a small screen it doesn’t work in quite the same way as a phone or tablet; you can swipe, but it has a ‘crown’ wheel on the side that acts as a scrolling device without your finger getting in the way of the screen. It remembers the people you communicate with most frequently and presents a screen of them by icon and initial so you have quick access. My verdict – I’m not a raving fan, but I quite like it. In case you were wondering the bottom end of the price scale is £399 (at the time of writing) and the top end is in the thousands!